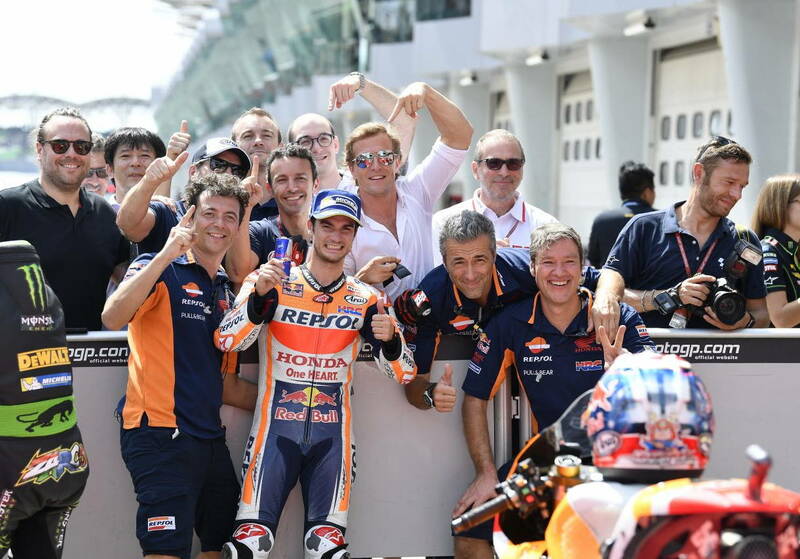 Dani Pedrosa (Honda) took pole position for tomorrow’s Sepang race during qualifying earlier today. The other two riders on the front row tomorrow will be Johann Zarco (Yamaha) and Andrea Dovizioso (Ducati). Championship points leader Marc Marquez (Honda) could only manage the 7th quickest time after an early crash in Q2 forced him to change bikes. You can find full qualifying results here. Stay tuned for further race coverage on MD. The last 10 minutes of qualifying was awesome.. Roosi had pole, Zarco had pole, Lorenzo had pole, Vinales had pole, Marques had a high speed low side, and had to push his bike quite a ways, Crutchlow wadded up another one, ..then finally Dani got pole. Well after staying up until 4 am to watch the race, I take back what I said above about the race ought to be good. Yep, the only excitement in this entire race came during the first half of the first lap, when everyone was crashing. Kudos to everyone’s favorite Excitable Brits for trying to inject some enthusiasm into the proceedings, but there was never any doubt that Dovi was either going to crash or win. Other than for the possibility of Dovi crashing, there was zero chance Lorenzo was going to stay ahead of him, or that Zarco was going to reel him in, or that Marquez was going to reel in Zarco. Great season overall, but there have simply been far too many rain/mixed condition races dictating who would and wouldn’t be competitive on any given weekend. It does seem like there have been a lot more races run under sketchy conditions this year than usual. Maybe that isn’t the case, but it sure seems like it. Lol. Yep, a bit of a snoozer. If the points were still close, I imagine Dovi and Marquez would have been dicing it up again, but alas, Dovi lost the title at Phillip Island.